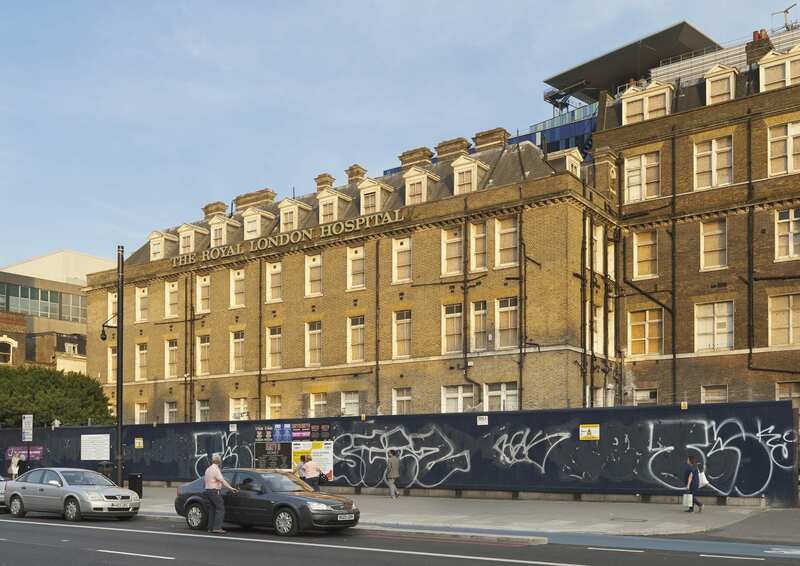 The long former Royal London Hospital complex on the south side of Whitechapel Road has its origins in the hospital built in 1752–78 to designs by Boulton Mainwaring. Its eastern section was constructed in 1873–6 as part of the Grocers’ Company’s Wing, built at the same time as a Post Mortem Department and Nurses Home. Their completion secured the hospital’s status as the largest general hospital in the country, with almost 800 beds. 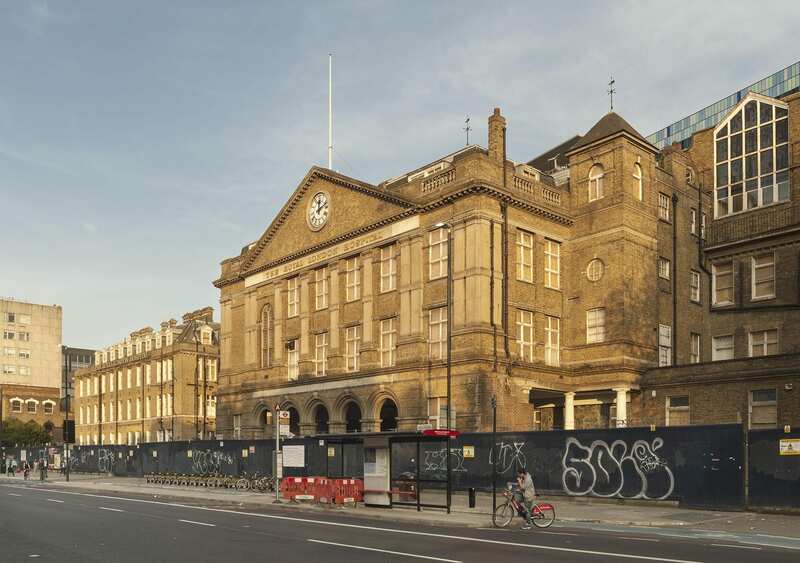 The only remnant of this building programme is the north range of the Grocers’ Company’s Wing, which presents an orderly 120ft frontage to Whitechapel Road terminating at its junction with East Mount Street. Two bays of the south part of the wing survive; the rest was cleared in the 1960s for the construction of the Holland Wing (demolished). At the time of writing, the north range of the Grocers’ Company Wing lies empty as the former hospital awaits conversion into a civic centre for Tower Hamlets Council. Despite 140-years of hospital use, the surviving portion of the Grocers’ Company’s Wing retains its back-to-back ‘Nightingale’ wards and neat brick frontage overlooking Whitechapel Road. The proposed solution was to extend the hospital to provide 200 additional beds. A public fundraising campaign was launched with the aim of securing £100,000 towards new buildings and the operating costs of an enlarged hospital. A new wing extending east from the front block was deemed preferable to ensure the proximity of new wards to the ‘working centres’ of the hospital, namely the lifts, the staff offices, the laundry, the kitchen, the operating theatre, and the depository. 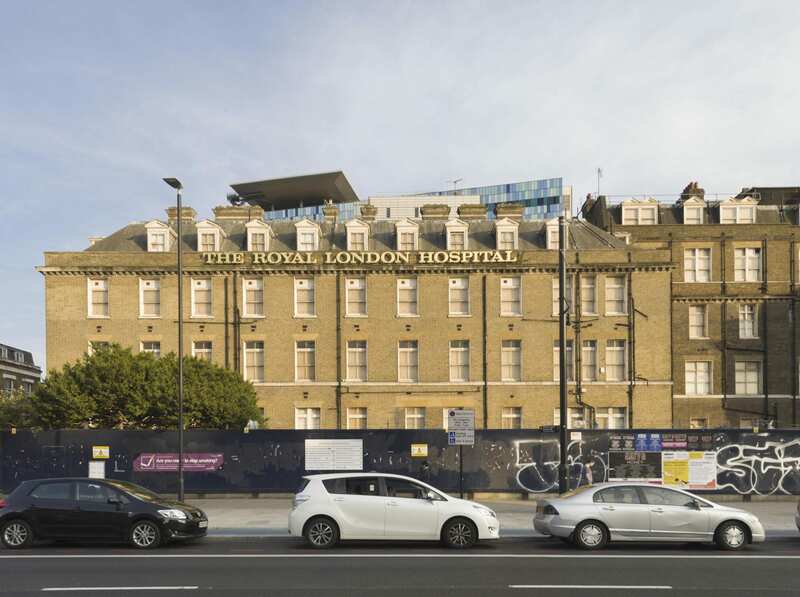 The intended site was occupied by the old medical college and a carriage shed fronting Whitechapel Road, along with various workshops, sheds and stables in East Mount Street. The centrepiece of this wave of hospital expansion was the Grocers’ Company’s Wing, named in recognition of a donation from the City livery company. Their ‘princely gift’ was accompanied by numerous conditions, including that the proposed wing should be completed within three years. Whilst the House Committee had intended to postpone work on the new east wing until the fundraising campaign had realised its target, the Company stipulated that construction should begin immediately. As the projected cost of the wing exceeded £25,000, it was reasoned that sole responsibility for its design should be entrusted to Charles Barry, Consulting Architect to the hospital. He planned an L-plan three-storey wing with basement and attics, composed of two blocks; a north range extending east from the front block in line with Whitechapel Road, and a south range running along East Mount Street. This arrangement preserved a yard between the extension and the main building, with the benefit of supplying light and ventilation to the inward-facing wards. The plan of the principal floors of each block followed the pattern of the earlier ward wings, comprising paired back-to-back wards separated by a central spine wall with fireplaces. On each floor, the north range was accessed from its south-west corner via lobbies connected with the long corridors of the front block. Partitions at the west end of the wards formed linen stores and areas for water closets, kitchens and sinks. The attics provided dormitories for seventy nurses. A foundation stone was laid on 27 June 1874. Construction by Perry & Co. was complicated by the intended route of the East London Railway, set to curve beneath the north-east corner of the new wing. As a precautionary measure, the foundations nearest the railway line were excavated to a depth of thirty-five feet and filled with concrete. The outward appearance of the new wing matched the austerity of the Alexandra Wing, with plain brick elevations decorated by a string course and a dentil cornice of Portland stone. The tiled roof was punctuated by pedimented dormer windows that admitted light into the attic dormitories, and tall brick chimneys with oversailing tops and stone string courses. Two rear towers rose above the roofline of the wing, displaying louvered openings and steeply pitched roofs; one contained a water tank and the other was fitted with a ventilation shaft. There were fireproof floors. At street level, a wooden carriage shed built in 1876 occupied the narrow stretch between the north front of the new wing and Whitechapel Road. The Grocers’ Company’s Wing was formally opened by Queen Victoria in March 1876, in a grand celebration reported to have lent ‘an attractive and joyous aspect to (an) ordinarily dull and dingy but busy quarter’. In the following months, patients were gradually moved into the new wards, which were praised for their ‘light and pleasant aspect’. The wards were fitted with specialised ventilation systems devised by T. Elsey and George Jennings. Two rows of evenly spaced beds extended across the long walls of each ward, facing inwards. This utilitarian arrangement was relieved by potted flowers and pictures on the walls amongst formal plaques bearing the name of each ward. At the time of writing (January 2017), the appearance and plan of the north range of the Grocers’ Company’s Wing had survived with only minor alterations, despite changes in room use. By the 1930s an operating theatre was located on the north side of the ground floor, lit by a large bay window overlooking Whitechapel Road. On the ground floor of the south range, wards were converted into isolation rooms. The X-Ray Department was housed in the basement of the north range and later extended to accommodate a suite of rooms, including several X-Ray rooms, dark rooms, a film store and offices. The building closed in 2012, when the hospital moved into its new premises. 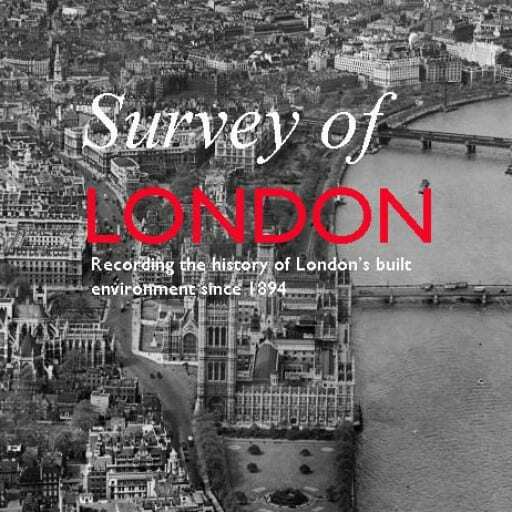 Royal London Hospital Archives & Museum (RLHA), RLHLH/A/5/35, pp. 58, 86, 110–1, 123, 208, 425, 439. ‘London: Saturday, March 11, 1876’, Illustrated London News, Issue 1911, p. 242. ‘The Queen’s Visit to Whitechapel, Reynolds’s Newspaper, Sunday 12 March 1876.